Life is better with choices, and your tooth replacement is no different. Dentures give you back your missing teeth as well as some of the gum tissue, and they are a good solution in the short-term. Dental implants take longer from start to finish, but they provide a sturdier replacement overall. 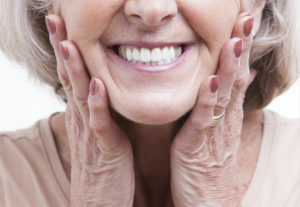 Wondering whether dental implants or dentures are best for you? We’ve got the top three reasons you might want to choose a denture in Orange Park, FL from Dr. Nawrocki below. If you need a tooth replacement in a hurry, dentures are probably the best option for you. Older patients often choose dentures because they can enjoy life with a complete smile again almost immediately. Dentures can be completed in a couple of weeks, or even on the very same day. Dental implants, on the other hand, require several visits to the dentist and may take up to a whole year to complete. The total time for dental implants may be even longer if preparatory procedures like bone grafting or sinus lift are needed to build up the jawbone structure before implantation. There is no doubt about the fact that dental implants come with a hefty price tag. True, they are the very best tooth replacement option available, but patients are often unable to afford to pay thousands for dental implants — especially when many teeth are missing. Dentures cost much less upfront, but keep in mind that even with proper maintenance, full and partial dentures will need to be replaced every six or seven years as your jawbone gradually changes shape without the stimulation provided by the roots of the teeth. From poor overall health to gum disease or heavy tobacco use, a number of factors may negatively affect a patient’s candidacy for dental implants. People with diseases that affect the immune system (cancer, HIV/AIDS, and uncontrolled diabetes) are at a high risk of implant failure, since recovery following the implantation procedure will be difficult. When patients are not able to undergo the procedure for implants, non-invasive dentures provide a good alternative to implant dentistry. Dentures are available in partial or complete sets. A partial denture fits in with the surrounding healthy teeth like a missing puzzle piece, and a full denture replaces a complete row of teeth in the upper or lower jaw. Partial dentures are supported with clasps and brackets, and a full denture is held in place with suction. A denture adhesive may be used to provide additional security. You and your dentist will discuss all of your tooth replacement options to determine which is best for you, your health, your lifestyle, and your budget. New and existing patients are encouraged to schedule an appointment with the dentist in Orange Park, FL today!